Apply online NVS application to NVS Recruitment 2017 683 Stenographer, LDC/Storekeeper, and Audit Assistant. Navodaya Vidyalaya Samiti (NVS) Recruitment Board, latest notification for Stenographer, LDC/Storekeeper, and Audit Assistant. Applicants can get full advertisement below and submit the NVS online application at www.nvshq.org. Applicants who are going to apply, ensure NVS notification that you are eligible for post of Stenographer, LDC/Storekeeper, and Audit Assistant e. The applicants will have to apply online, no other option. The last date of submitting online application is 13.12.2017. NVS jobs notification further information such as eligibility criteria, syllabus and how to apply etc. listed below. Each Position Such As Qualifications, Age Limit, Selection Procedure before Applying. Listed below. Education qualification: Pass 8th/10th/12th/Diploma (Nursing) Graduation Degree (B.com, B.sc) Post Graduation Degree or its equivalent qualification from a recognized Board / University. Selection: Computer Test, Skill Test, Trade Test. Age Limit: as on 30.10.2017. How to apply: Eligible applicant require to apply online through NVS Recruitment 2017 website www.nvshq.org from 13.12.2017. 1. 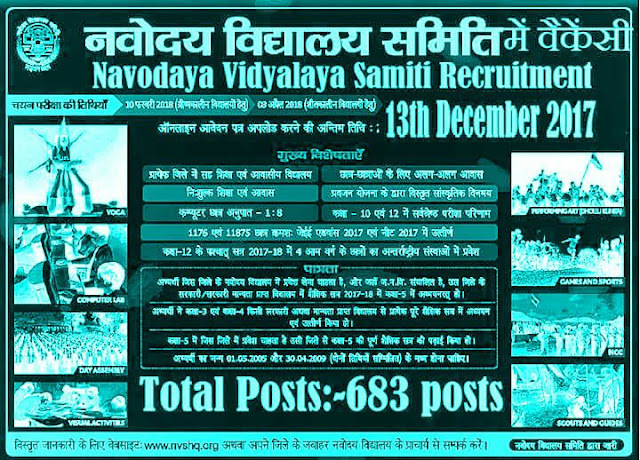 Log on to the Navodaya Vidyalaya Samiti (NVS) website www.nvshq.org. Applicants have great chance to get jobs Navodaya Vidyalaya Samiti (NVS) Recruitment, however if someone want to ask anything please comment below.